FREE ESTIMATE. 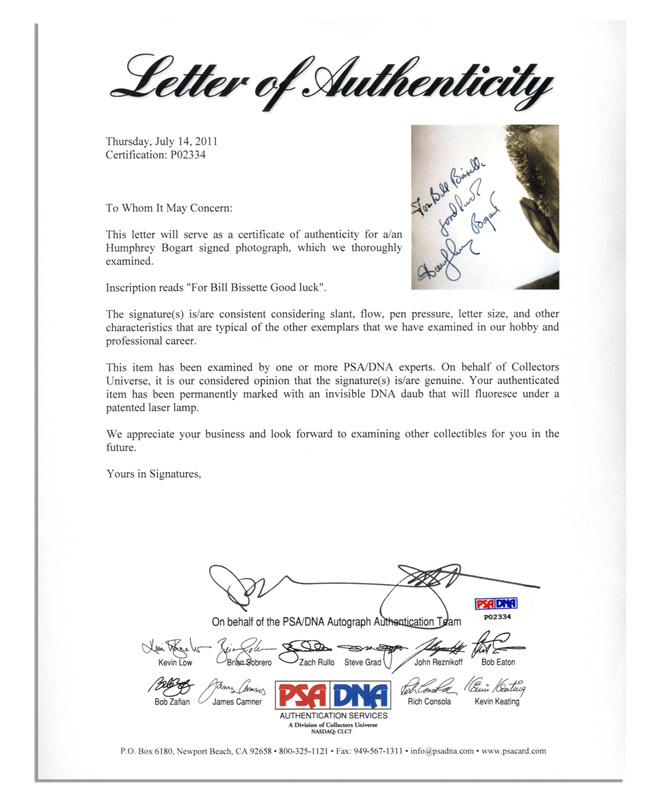 To buy, auction, sell or consign your Humphrey Bogart autograph that is for sale, please email Nate@NateDSanders.com or call the Nate D. Sanders Auction House (http://www.NateDSanders.com) office at (310) 440-2982. Humphrey Bogart is among Hollywood’s top legends. Bogart has appeared in over 45 films between the years of 1928 and 1956. The turning point in his career was starring in 1941’s “High Sierra”, which morphed him into a leading actor. Following “High Sierra” he starred in classics such as “The Maltese Falcon”, “Casablanca”, “The Big Sleep” and “Sabrina”. Humphrey Bogart was nominated for two Academy Awards for his roles in “Casablanca” and “The Caine Mutiny”. He won an Academy Award in 1952 for best actor in a leading role for his performance in “The African Queen”. 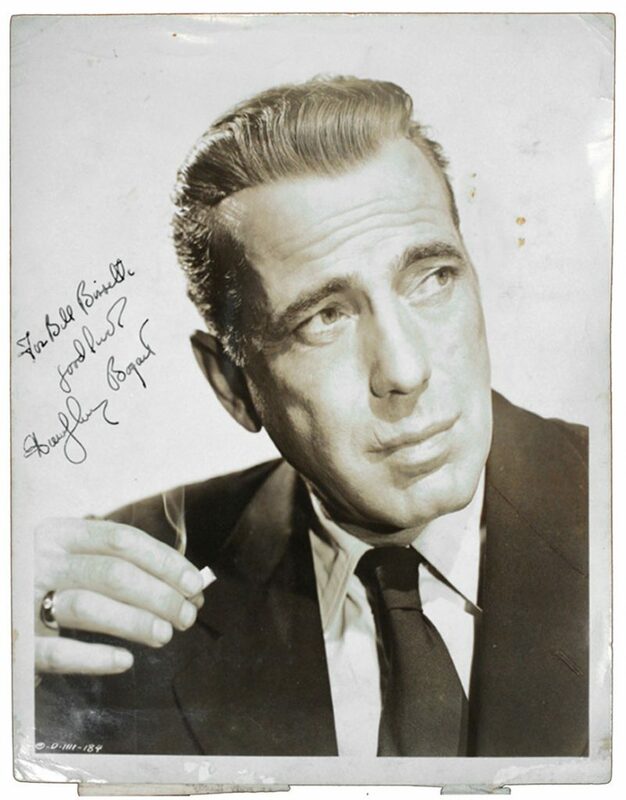 Humphrey Bogart memorabilia is very popular with old Hollywood collectors. Some items we have sold at auction with a Humphrey Bogart autograph are below. Exceptional signed photo by film icon Humphrey Bogart, here in full character as a dashing knockabout with cigarette in hand. 8″ x 10″ photograph is perfectly signed “For Bill Bissette / good luck / Humphrey Bogart”. On the verso is a piece of paper with the cast of “Dead Reckoning” and a stamp “Property of the News Library” with the date 27 January 1947. In very good condition with a few light creases, minimal spotting to the upper right portion and rounded corners. 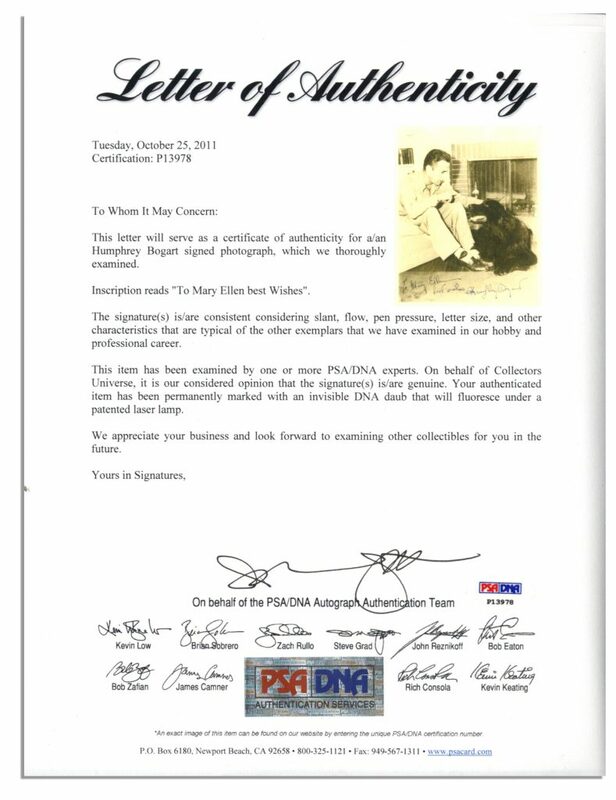 Absolutely stunning photograph accompanied by a COA from PSA/DNA. Sold for $2,623. Humphrey Bogart Autograph Portrait. Click to enlarge. LOA for Humphrey Bogart Autograph Portrait. 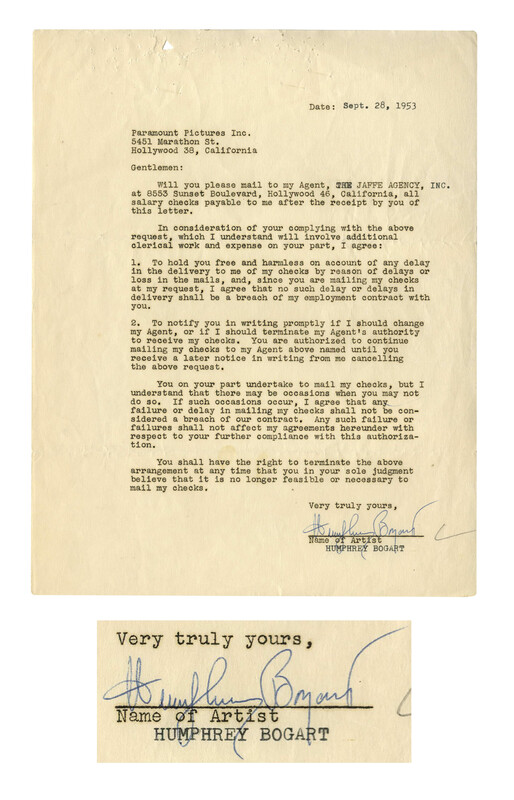 Humphrey Bogart letter signed from 28 September 1953, the time between his Academy nominated performances in “The African Queen” and “The Caine Mutiny”. Here, Bogart authorizes Paramount Pictures to send his checks to his agent, The Jaffe Agency. Bogart’s agent, Sam Jaffe, once took a $100,000 life insurance policy out on Bogart when Bogart’s then wife, Mayo Methot, produced a pistol at a dinner party and threatened to kill Bogart if he left her. Letter measures 8.5″ x 11″. Several staple punctures to top producing small tear, overall very good plus condition with a stylized signature from Bogie. 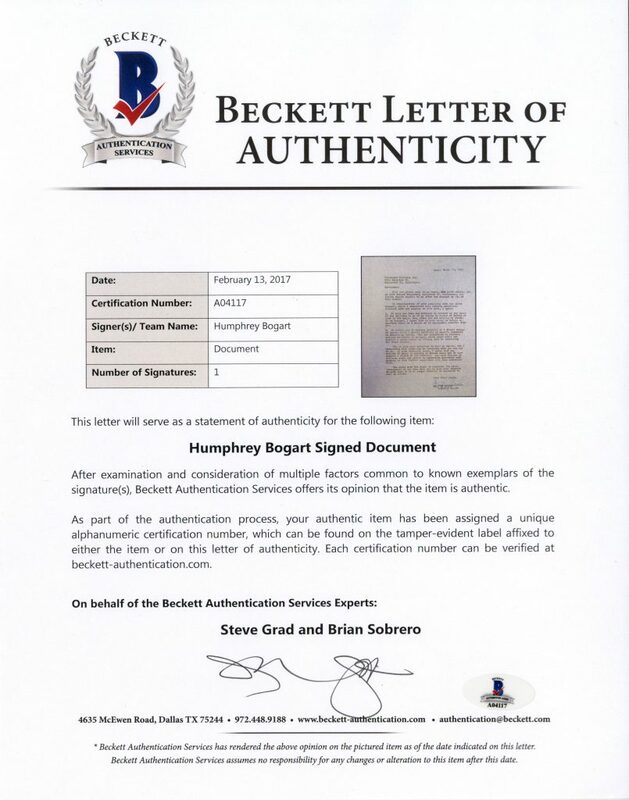 With Beckett COA. Sold for $2,443. Humphrey Bogart Autograph Letter Signed. Click to enlarge. LOA for Humphrey Bogart Autograph Letter Signed. Click to enlarge. Humphrey Bogart Signed 8″ x 10″ Photo — “Bogie” Relaxes in an Informal Setting Petting a Dog — Excellent Signature — With PSA/DNA COA. Humphrey Bogart signed 8″ x 10″ matte photo. Bogie signs “To Mary Ellen / best wishes / Humphrey Bogart”. Bogart is shown here relaxing with a dog who looks up adoringly at the star, ranked by The American Film Institute as the greatest male star in American cinema. Incidentally, Bogart’s own dog, Zero, starred with him in the 1941 film “High Sierra.” Photo shows minor creasing not affecting the excellent signature. Overall near fine condition. With PSA/DNA COA. Sold for $1808. Humphrey Bogart Signed 8″ x 10″ Photo — “Bogie” Relaxes in an Informal Setting Petting a Dog — Excellent Signature — With PSA/DNA COA. Click to enlarge. 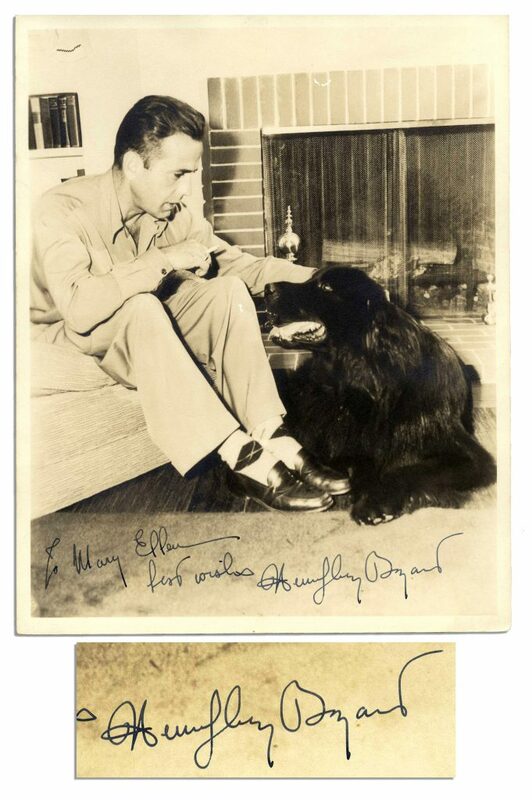 PSA/DNA COA for Humphrey Bogart Signed 8″ x 10″ Photo — “Bogie” Relaxes in an Informal Setting Petting a Dog . Click to enlarge. Unheard of Katharine Hepburn & Humphrey Bogart Autographs — “African Queen” Stars — With PSA/DNA COA. 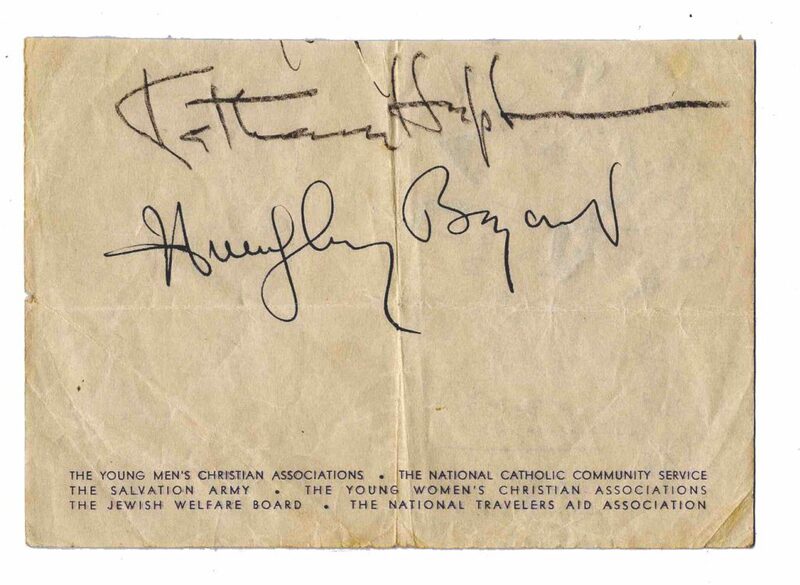 Very scarce signatures of both Katharine Hepburn and Humphrey Bogart appearing on a piece of paper measuring 5.5″ x 4.75″. Some creasing and folds to paper, with signatures remaining crisp and bright. Overall in very good condition. 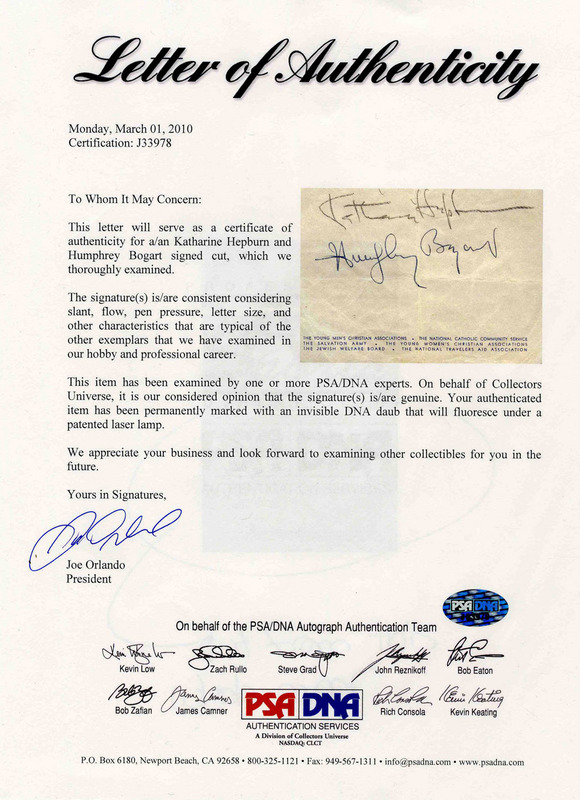 Accompanied by a Certificate of Authenticity from PSA/DNA for both signatures. Sold for $2,000. Unheard of Katharine Hepburn & Humphrey Bogart Autographs — “African Queen” Stars — With PSA/DNA COA. Click to enlarge. PSA/DNA COA for Unheard of Katharine Hepburn & Humphrey Bogart Autographs — “African Queen” Stars . Click to enlarge. 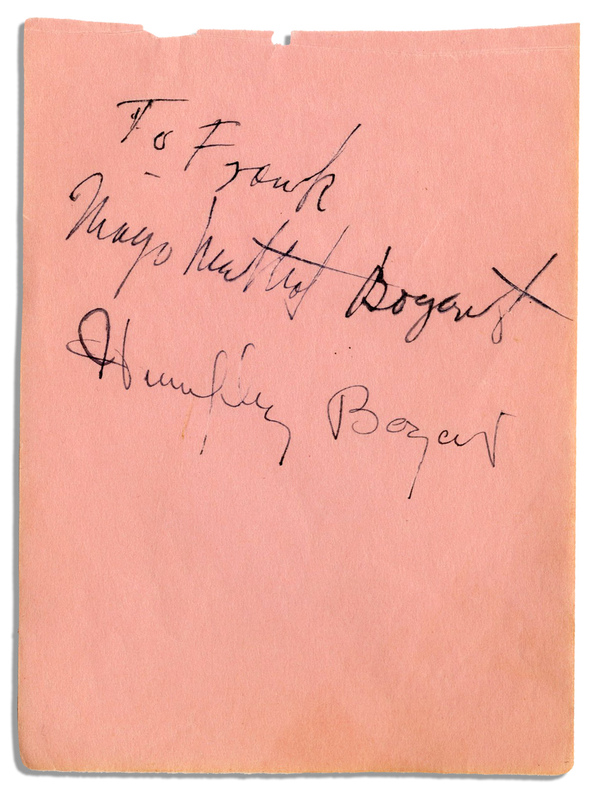 Humphrey Bogart autograph, signed at the height of his career when he was married to Mayo Methot and made the films “Casablanca,” “The High Sierra” and “The Maltese Falcon.” Bogart signs “Humphrey Bogart” on an album page below the inscription of his wife who writes, “To Frank / Mayo Methot Bogart”. Minor toning to edges and small chip to top. Overall in very good condition. Sold for $653. Humphrey Bogart Autograph. Click to enlarge.